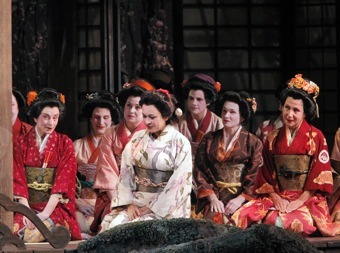 Puccini's Madama Butterfly continues its run at the War Memorial Opera House with a scheduled change of cast: leading Italian soprano Daniela Dessì has taken up the title role from November 5th, and Bulgarian director Julian Kovatchev has substituted Maestro Nicola Luisotti for the remaining performances until November 27th. As Laura Biggs wrote in her review of the first night, Clarke Dunham's staging, built in the 1980s for Harold Prince's Lyric Opera of Chicago production, still serves the opera well, and confers "a delicate charm" on the whole stage Changes of scene were subtle and technically well conceived: actors dressed in black would make the stage slowly turn round without disrupting the action, thus making it possible to avoid pauses between scenes. Lighting by Christine Binder (originally designed by Ken Billington) conveyed an overly indulgent atmosphere; at the same time, it added a gentle and warm touch on the staging. Some of the dynamic elements, such as the model for the ship carried by an actor to signify Pinkerton's ship approaching, pushed the (orientalist) fairytale-like qualities of the story too far. Yet overall, it was a harmonious staging. On the musical side, the first performance featuring Dessì and Kovatchev followed a line of crescendo: it started with a somewhat general vocal inconsistency from the cast, but the quality improved gradually until it culminated into a convincing rendition of Puccini's score. Dessì's timbre came across as slightly tottering in her entrance lines, was generally a bit unstable in the highest tessitura, and her fortissimo revealed a very wide vibrato. On the other hand, she was in control of her voice in the less spinto parts, and her pianissimos were delivered with astounding precision. Her "Vogliatemi bene" was one of the highlights of the whole night: she whispered her lines in a heartbreaking manner that. Stefano Secco also offered a mixed portrayal of Pinkerton: his warm and mellow timbre was marvellous, as was the care taken with Puccini's long and powerful phrases However, the orchestra overpowered him for most of his performance, and some of the expressive power was lost. Daveda Karanas started hesitantly as Suzuki, but she soon warmed up: the colour of her voice was perfect to portray Cio Cio San's caring friend. Her acting was also expressive: she managed to convey the anxiety and lovingness that her role requires. Quinn Kelsey was a vigorous Sharpless. As with Secco, he was at times vocally overpowered by the orchestra. Nevertheless his timbre was deep and powerful. He gave his best in the last act, in his interaction with the hopeful Cio Cio San. Thomas Glenn as Goro was one of the most convincing characters, both dramatically and vocally, and so was Christian Van Horne as the Bonze, who had an impressive stage presence and intimidating timbre. Once again, a round of applause goes to Ian Robertson and his Chorus. 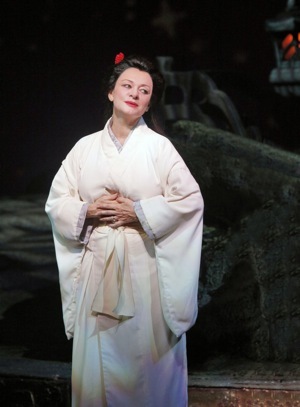 In fact, the most touching moment of the whole performance was the Humming Chorus at the end of Act II, when everything is asleep and Suzuki, Cio Cio San and her son wait for the return of Pinkerton. The Chorus' soft and accurate humming enveloped the scene with melancholic and silent eloquence. If on the vocal side the performance was heterogeneous, the orchestra was probably the best part of the night. Julian Kovatchev successfully debuted at the War Memorial Opera House. He had already conducted this opera in Stuttgart and Geneva and showed a deep knowledge of the score. The orchestra sounded dense and bold; in particular, brasses and strings were practically flawless. I have only a few regrets: I wish that the coordination between stage and pit had been precise in every moment (in some pianissimo scenes there were a few uncertainties) and that the crescendo to fortissimo had been prepared with a calmer pace, rather than being presented in explosive movement - which was very effective but a bit too sensational for my taste.